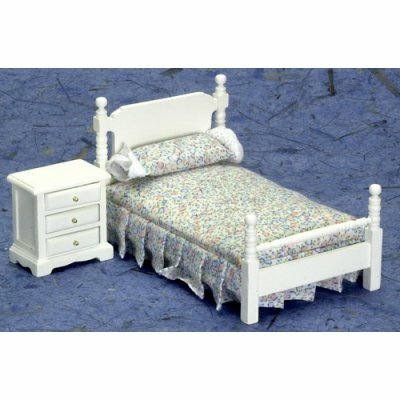 This miniature dollhouse bedroom furniture set is a twin sized wooden bed with linens included and a 3 drawer nightstand in white. 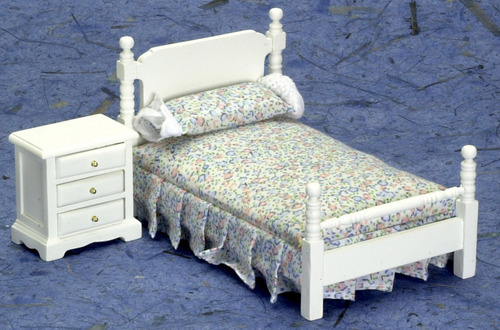 The miniature bed measures 3.5"H x 3.75"W x 6.25"D and all 3 drawers on the dollhouse nightstand work. This Twin Bed w/ Linens & Nightstand - White is supplied by Aztec Miniatures, which generally ships within 8 business day(s) of you placing your order .